FIRST RELEASED - 2013. MANY THANKS TO USERS AROUND THE WORLD FOR MAKING THIS APP A HUGE SUCCESS. * App notifications included now in flash alerts. So that you can get flash alerts when you receive any Facebook feed, even a What’s App message or a tweet from twitter. * Do Not Disturb style feature we have included, so that if flash alerts is on, then you can actually, deactivate flash alerts for your favorite contacts individually. So that you get calls from them. Similarly for messages as well. * Get flash alerts controlled by watch/time now. So that you can fix a particular time like from 11am to 4 pm you get only flash alerts and rest of the time you get regular calls. - When you receive a call or a text message, the flash will blink. - You can receive flash alerts by particular contacts in your phonebook/contact list. - You can receive flash alerts when your battery percentage goes below 20%. - You can get flash alerts during particular time as well. - You can change the blinking frequency like if you want flash alerts to be slow or high. - Whenever you receive app notifications alerts like a Whatsapp notification, flash light will blink. Best if you are having party and you can use it as LED lights or DJ lights. In this application you can control the intensity of flash alerts. It will give you flash light alerts which is very useful at times. We are listening! So your feedback matters to us, please email us and we would like to include your suggestions in future updates. 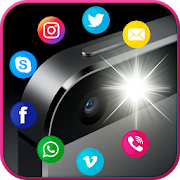 One of the cool flashlight alert or flash alert application in the play store. Very useful in the dark or at night when you do not want to hear ringtones. Do you want flash light alerts on call! Then download this application. Please note that no information of yours is stored or shared with any party. We respect your privacy.